Everyday I get asked about the best lenses and accessories for the Nikon D5100, so I decided to compile a list of my favorite stuff for beginners. All of the gear you see on this page has been tested by me, both in personal settings and for my photography business. So here’s how this guide works… I’ve broken down the most popular items for the D5100 into sections. You can scroll down and read through each section or you can quickly jump to a section by using the handy dandy drop down menu below. Enjoy! 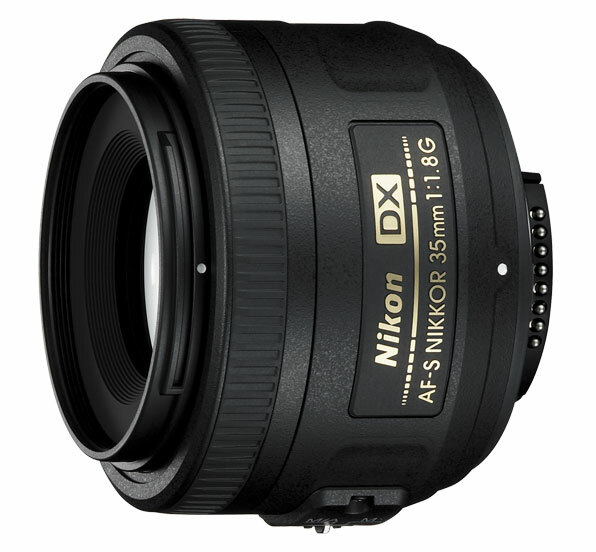 Here are my recommended starter lenses for the Nikon D5100. These are the same lenses I regularly recommend to family and friends who are looking to explore different types of photography. Consider this list of lenses as a starting point with room to grow into something more serious in the future. 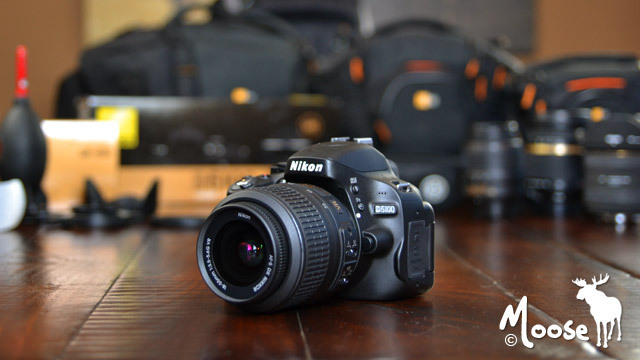 The most common filter size for the Nikon D5100 is 52mm. The 18-55mm (kit lens), 55-200mm f/4-5.6 and 35mm f/1.8G lenses all accept 52mm sized filters. When it comes to filter brands, I prefer B+W, Hoya and Tiffen…in that order. B+W is my favorite, both in terms of build quality and overall sharpness. 52mm UV: B+W, Hoya, Tiffen – The primary purpose of a UV filter is to protect your front lens glass element. If you’re shooting near the ocean or within range of flying debris, then it would be a good idea to equip your lens with one. 52mm Circular polarizer: B+W, Hoya, Tiffen – Circular polarizers allow you to capture deeper blue skies, more cloud detail, less reflection off water surfaces and added color saturation when shooting outdoors in bright light. 52mm Neutral Density 3 Stop Filter: B+W, Hoya, Tiffen – A 3 stop ND filter will allow you to use fill flash with larger apertures (low f-numbers) in bright light. This gives you the ability to isolate your subject against a blurry background, while utilizing the built-in flash to eliminate harsh shadows under full sunlight. 52mm Neutral Density 9 and 10 Stop Filters: B+W, Hoya – A 9 or 10 stop filter will allow you to capture long exposures in the middle of the day. This gives you the ability to capture silky smooth waterfalls or skies with streaking clouds. The next most common filter size for the D5100 is 58mm. The Nikon 50mm f/1.8G and 55-300mm f/4.5-5.6 both accept 58mm filters. 58mm UV: B+W, Hoya, Tiffen – See the info posted above for the 52mm UV filter. 58mm Circular polarizer: B+W, Hoya, Tiffen – See the info posted above for the 52mm circular polarizer filter. 58mm Neutral Density 3 Stop Filter: B+W, Hoya, Tiffen – See the info posted above for the 52mm 3 Stop ND filter. 58mm Neutral Density 9 and 10 Stop Filters: B+W, Hoya – See the info posted above for the 52mm 9 and 10 Stop ND filter. Compact – The Caselogic SLRC-200 holster is great for holding the D5100 with kit “sized” lens attached. I recommend replacing the included strap with a Crumpler Strap. Small: The Caselogic SLRC-201 zoom holster is great for holding the D5100 with kit “sized” lens attached. I recommend replacing the included strap with a Crumpler Strap. Medium – The Case Logic SLRC-202 bag is great for holding the D5100 with kit “sized” lens attached in addition to 2 zoom lenses or 1 zoom lens and 2 small prime lenses in the side pockets. I recommend replacing the included strap with a Crumpler Strap. Traveler – The Case Logic SLRC-205 sling bag or the Lowepro 202 AW SlingShot is great for hikers and those who like to shoot while carrying their equipment. The sling design allows you to quickly access pockets without having to remove the bag from your shoulder. Stylish – The Lowepro Passport sling bag or the Crumpler 5 Million Dollar messenger bag are great all purpose bags that can neatly hold the D5100 along with your other daily essentials without “looking” like a camera bag. Ladies – The BUILT Cargo bag or the Crumpler 5 Million Dollar messenger bag have been recommended by my wife as “female approved”. The nice thing is that these bags are also “dude” approved, so your significant other won’t feel like he’s carrying a purse. Crumpler Industry Disgrace Strap – Don’t let the weird name confuse you, this is most comfortable strap you’ll ever wear. It’s super light and doesn’t cut into your neck or shoulder like the Nikon strap does. This strap can also be attached to camera bags, which makes them much easier to carry around for a day of shooting. Black Rapid RS4 with FastenR-3 Camera Strap – If you’re looking to leave your camera bag at home, the Black Rapid camera strap system is fantastic solution for those who like to travel light. The sling type strap is much longer than the included Nikon strap, which allows you to rest the D5100 on your hip…ready at a moments notice. Giottos Rocket Air Blaster – Great for getting rid of dust that settles on your lenses, viewfinder, and in-between buttons and knobs. Giottos retractable goat hair brush – Fantastic for getting rid of the dust or lint that the air blaster failed to remove. Zeiss Pre-Moistened Lens Cloths – If you get finger smudges or residue on your lens, these wipes work wonders. Plus, each wipes comes in a self contained foil wrapper so you can store a couple in your bag and leave the rest at home. You’ll soon find out that the built-in flash equipped with the D5100 is fine when used outdoors as fill light to remove harsh shadows, however, in low-light situations it tends to blast your subject with light that looks unnatural. To get more natural looking light when shooting indoors, an external flash will allow you to bounce the light off a ceiling or wall rather than directly at your subject. In doing this, the light spreads evenly throughout the room giving you a well light subject and background. Long exposure photography: The Nikon MC-DC2 wired remote is great for capturing long exposures like waterfalls, streaking clouds and starry nights. Self-portraits and macro photography: The Nikon ML-L3 wireless remote is great for situations where you’d like to include yourself in the photo or when positioning subjects in front of the camera (food, products and other macro subject). Check out my in-depth memory card write-up for the Nikon D5100 which sheds some light on the number of images you can expect to take, estimated movie recording times and other important info. The Nikon D5100 is compatible with the EN-EL14 lithium ion battery. While sometimes it’s ok to go with third party batteries, I have yet to find a good alternative to the Nikon branded EN-EL14. 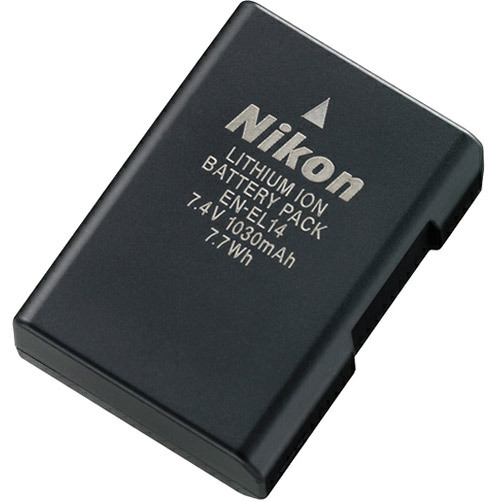 EN-EL14 battery – This battery will give you approximately 500 to 660 shots with the Nikon D5100. Less if you utilize the LCD screen for image/video playback/live-view or if you use the built-in flash.